Author(s): Mahesh T. Chhabria, Department of Pharmaceutical Chemistry, L. M. College of Pharmacy, Navrangpura, Ahmedabad 380009, Gujarat, India. Shivani Patel, Palmi Modi, Pathik S. Brahmkshatriya. Thiazole, a unique heterocycle containing sulphur and nitrogen atoms, occupies an important place in medicinal chemistry. It is an essential core scaffold present in many natural (Vitamin B1- Thiamine) and synthetic medicinally important compounds. The versatility of thiazole nucleus demonstrated by the fact that it is an essential part of penicillin nucleus and some of its derivatives which have shown antimicrobial (sulfazole), antiretroviral (ritonavir), antifungal (abafungin), antihistaminic and antithyroid activities. The synthetic importance of thiazole derivatives, its reduced forms and condensed derivatives have been increased much by their recent applications as anticancer (tiazofurin), anthelmintic, vulcanising accelerators (mercaptobenzothiazole) and photographic sensitizers. Thiazole chemistry has developed steadily after the pioneering work of Hofmann and Hantsch. Bogert and co-workers made significant contribution to expand this field. Mills established the importance of thiazole ring in cyanine dyes which is used as photographic sensitizer. Benzothiazole, a fused derivative of thiazole have also proved its commercial value. Present review describes chemical and biological importance of thiazole and its condensed derivatives with an emphasis on recent developments. Keywords: Thiazole, Heterocycle, Medicinal chemistry, Benzothiazole, Biological activity, Synthesis. Affiliation:Department of Pharmaceutical Chemistry, L. M. College of Pharmacy, Navrangpura, Ahmedabad 380009, Gujarat, India. Keywords:Thiazole, Heterocycle, Medicinal chemistry, Benzothiazole, Biological activity, Synthesis. Abstract:Thiazole, a unique heterocycle containing sulphur and nitrogen atoms, occupies an important place in medicinal chemistry. It is an essential core scaffold present in many natural (Vitamin B1- Thiamine) and synthetic medicinally important compounds. The versatility of thiazole nucleus demonstrated by the fact that it is an essential part of penicillin nucleus and some of its derivatives which have shown antimicrobial (sulfazole), antiretroviral (ritonavir), antifungal (abafungin), antihistaminic and antithyroid activities. 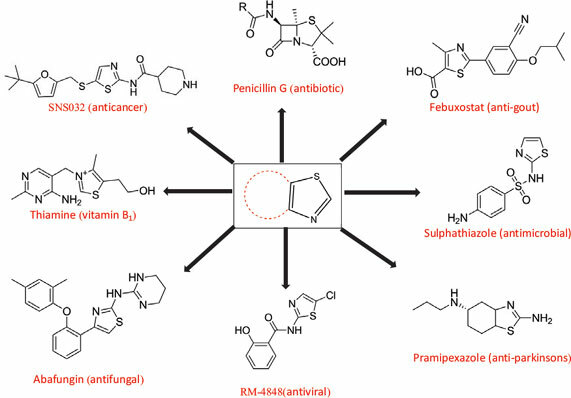 The synthetic importance of thiazole derivatives, its reduced forms and condensed derivatives have been increased much by their recent applications as anticancer (tiazofurin), anthelmintic, vulcanising accelerators (mercaptobenzothiazole) and photographic sensitizers. Thiazole chemistry has developed steadily after the pioneering work of Hofmann and Hantsch. Bogert and co-workers made significant contribution to expand this field. Mills established the importance of thiazole ring in cyanine dyes which is used as photographic sensitizer. Benzothiazole, a fused derivative of thiazole have also proved its commercial value. Present review describes chemical and biological importance of thiazole and its condensed derivatives with an emphasis on recent developments.